Prince William is to serve on attachment with the Royal Air Force and Royal Navy next year, Clarence House has announced. 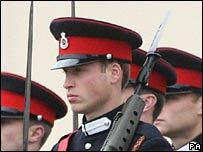 William is an officer in the Household Cavalry's Blues and Royals, after graduating from Sandhurst in December. It had been reported that the prince was thought to be planning the attachments to prepare for his future role as head of the armed forces. The 25-year-old will start his secondment with the RAF in January. That is scheduled to last four months and the prince, who is second in line to the throne, will then serve with the Royal Navy. The secondments will follow a year with the Blues and Royals, where William is a 2nd Lieutenant commanding 12 men. Prince Harry is also a 2nd Lieutenant - referred to as a Cornet - in the Blues and Royals, after graduating from the Royal Military Academy Sandhurst in April last year. The Army decided earlier this year that Harry, 23, would not be sent to the conflict in Iraq. This represented a U-turn on an earlier decision that Harry would be sent as an armoured reconnaissance officer, and followed reports that militant groups in Iraq planned to kill or kidnap the prince. The princes' father, the Prince of Wales, trained as a pilot at RAF Cranwell in Lincolnshire at the beginning of the 1970s, before going on to command the Royal Navy minesweeper HMS Bronington. William has recently rekindled his relationship with Kate Middleton, whom he met at university, after the pair split up in April.